Family de Huntington | An accounting of the medieval journey of the de Huntington family. Welcome to the journal of the de Huntington family, a place where we can document our explorations into a world inspired by the medieval. 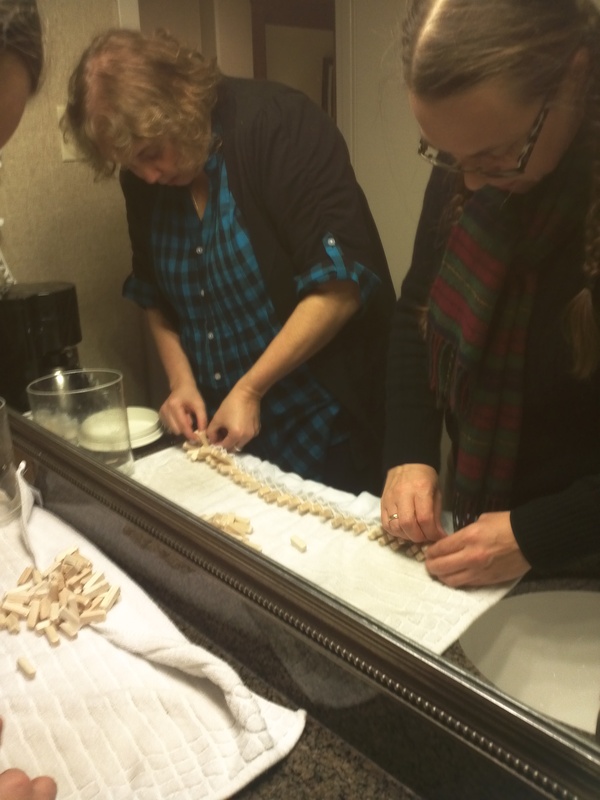 With personas in the late 14th century England, our family of four is learning to enjoy the arts, skills, and customs of our ancestors. This is the story of our journey. I have been exploring ruffled edges for a decade now using a variety of pleating, folding, fretting, and gathering techniques. And while I have further experimented with woven fillets, I sadly do not possess the skill to actually weave frilled edges. 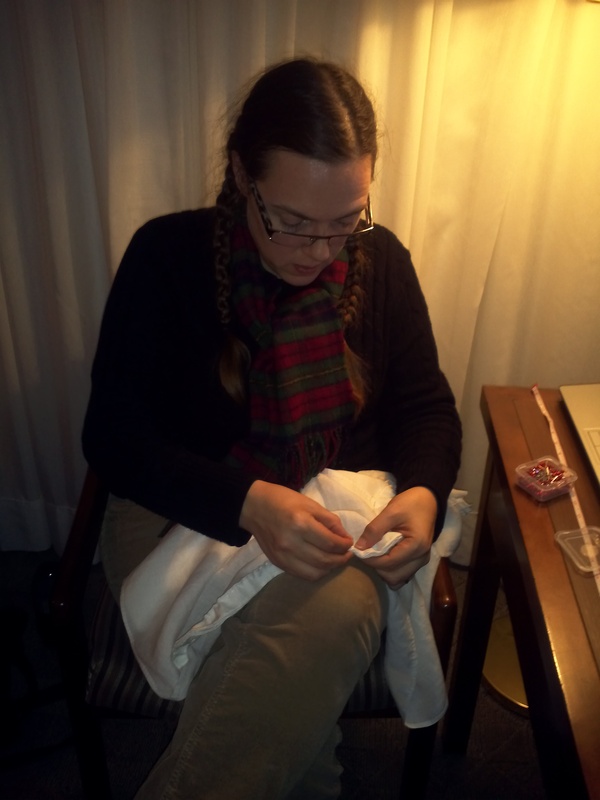 Recently, my friend Drifa in Rauða who is a Viking Age reenactor, decided to take on some experimental weaving that has been of great interest to me. We both began in the SCA in 2005 and actually live quite close to each other. Our paths and interests, however, have diverged as we have explored different cultures and time periods. I was very excited when Drifa contacted me to let me know she was going to experiment in creating woven edges inspired by the Report of Textiles from Burgos Cathedral. The work she has done over the last few months, in both silk and linen, has been inspiring. I’ve learned more about these textiles and it has been a joy to collaborate in discussions with her. This last weekend, I even had the opportunity to experiment with wearing her first linen ruffled veil (pictured above-left). #LifeGoals I would encourage all of my fellow ruffled veil enthusiasts to check out her blog posts. You won’t be sorry. Born of passion and devotion – Cristiana is by Ieuan and Gwyneth made Laurel. For a long time now, I’ve been thinking that it would be wonderful to see more women in An Tir wearing frilled veils. People always comment about how much they like them, but no one thinks they have the time to make one. And in all honesty, I can understand why some are reluctant. I have made five different ruffled veils now, and most of them took between 75-100 hours to make. Of course, each of those required a fair amount of research and experimentation, and were made using medieval techniques. I started by pressing a fairly long plain oval veil. I decided to start by using something that I already owned, an oval veil that I had purchased online years ago from Revival Clothing(http://www.revivalclothing.com/linenrectangularandovalveils.aspx). This was actually my very first veil. It was machined hemmed with a serger rolled hem. Because of this, I no longer really liked to wear the veil, preferring to wear veils that have been hand hemmed. However, this made it a perfect place to start for my Quick & Easy Ruffled Veil. Next, the veil was folded in half and cut into two half ovals. 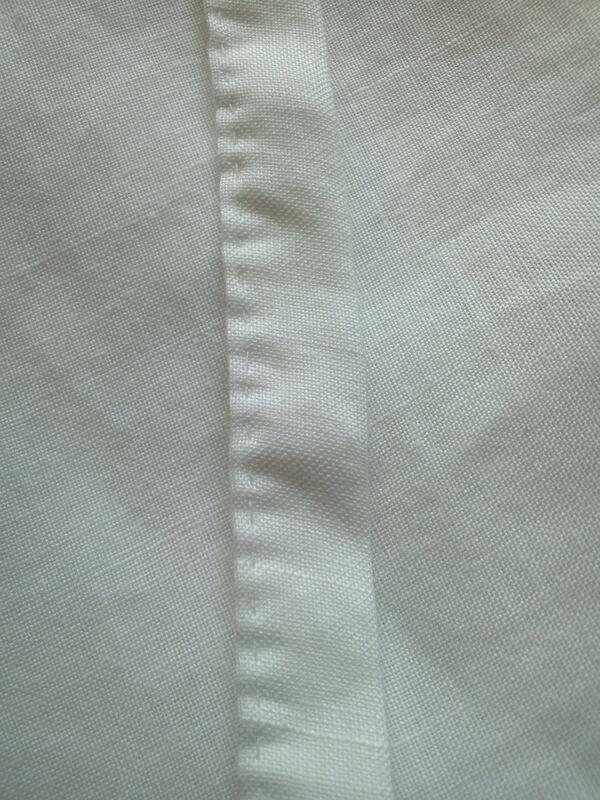 The front edge of the half oval was pressed for hemming. After the unfinished front edge of the veil was pressed, I did a standard rolled hem around the entire semi-oval veil. 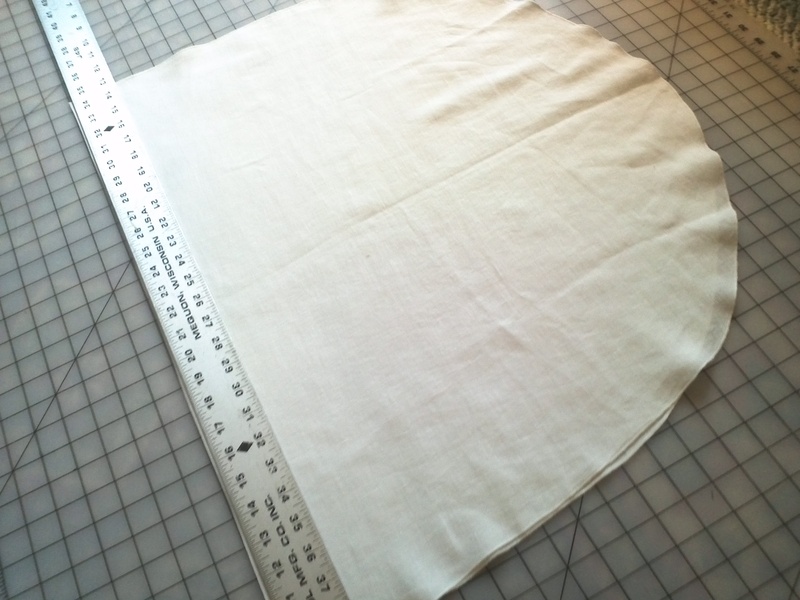 This was a fairly quick and simple process, as the curved portion already had a serger finished edge. 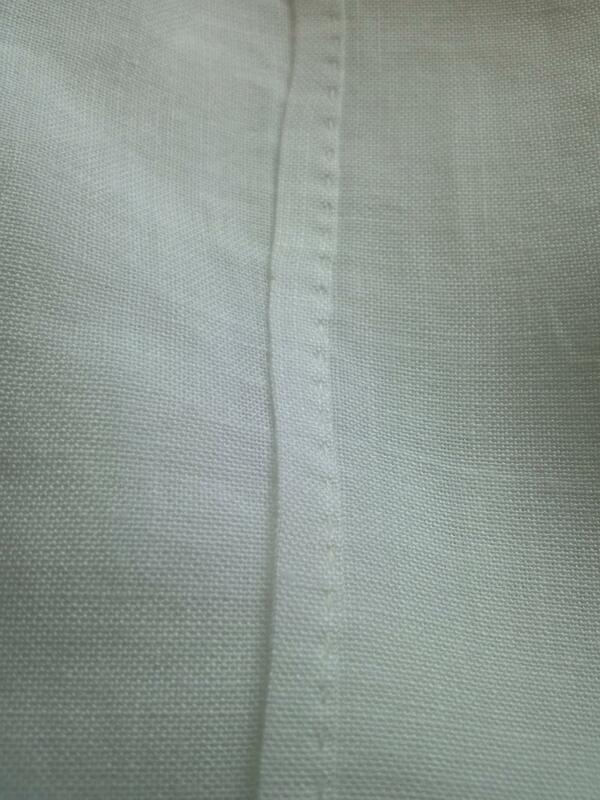 I find that hemming is always quicker when fabric has been serged first. The remaining half of the veil was cut into two inch strips. Fabric strips are run through a bias tape maker and then pressed. The next step was to cut the remaining half of the original oval veil into two inch strips using a quick rotary cutter. 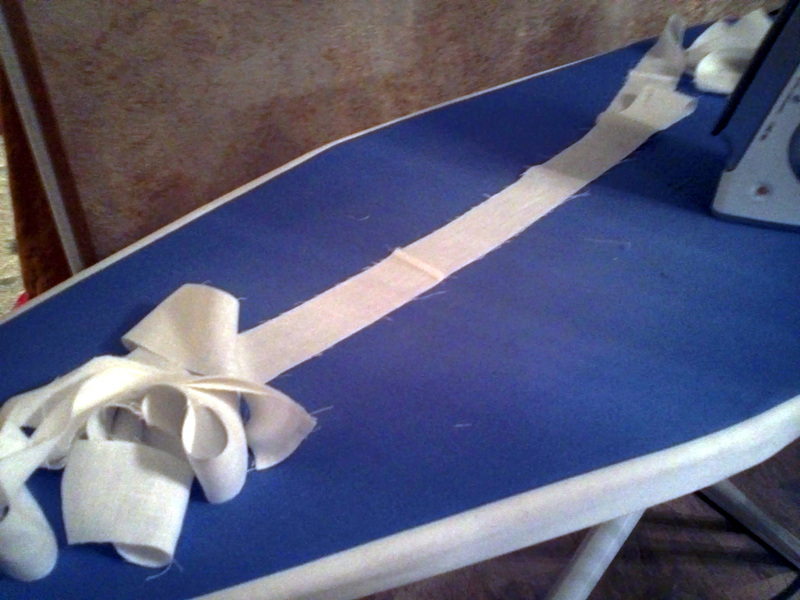 I then ran these strips through a bias-tape maker, pressing the strips flat with an iron. After these strips were pressed into 1 inch bias tape, I then folded them in half and pressed them flat again. Double folded & pressed veil bias tape. 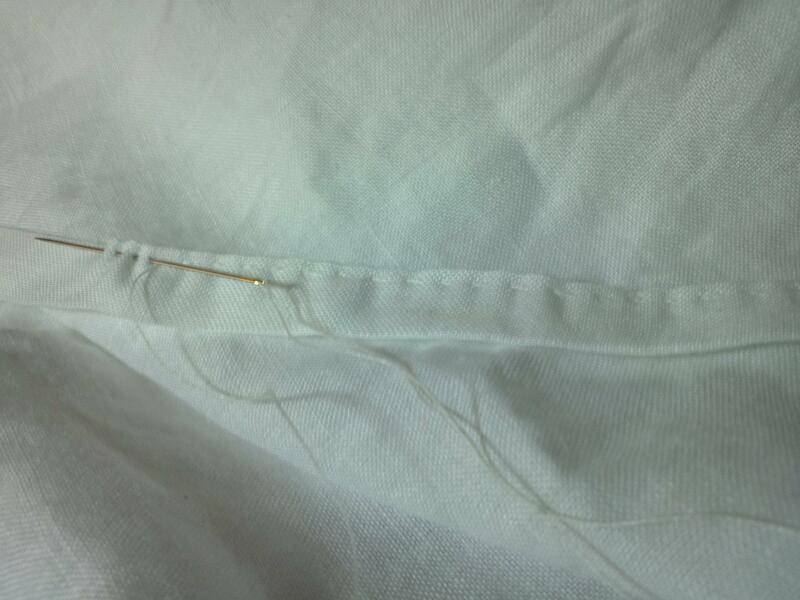 When the bias tape was completely pressed, I used a simple running stitch to sew the two sides together. 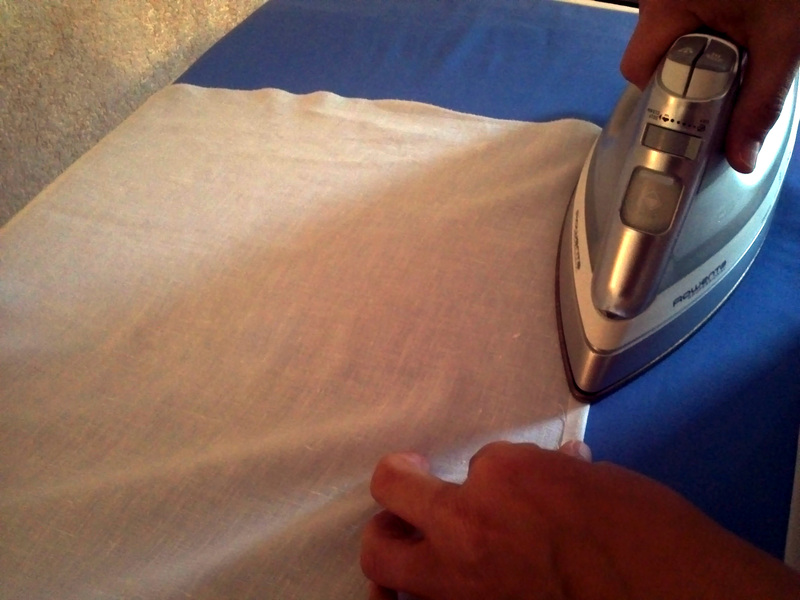 I did this by hand, but it could be done using a sewing machine, if you are short on time. Then I used a ‘disappearing fabric marker’ to mark every half inch on the veil tape. 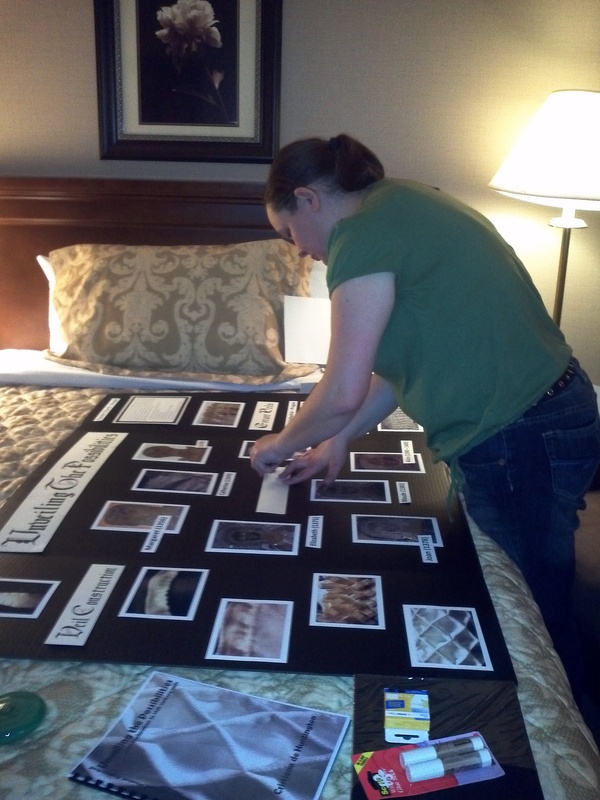 By marking with a pen instead of using straight pins, a significant amount of time was saved. 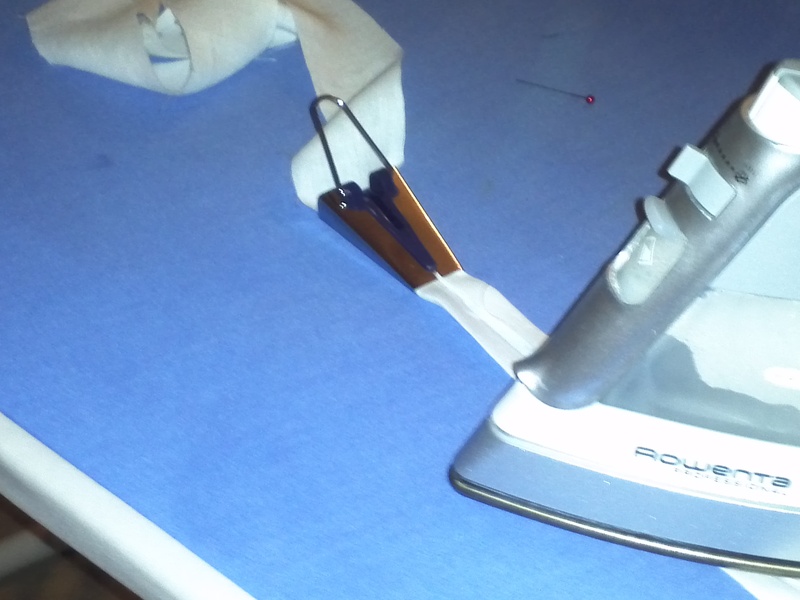 After that, I used the same fabric marker to place small marks every quarter inch on the front edge of the hemmed veil. 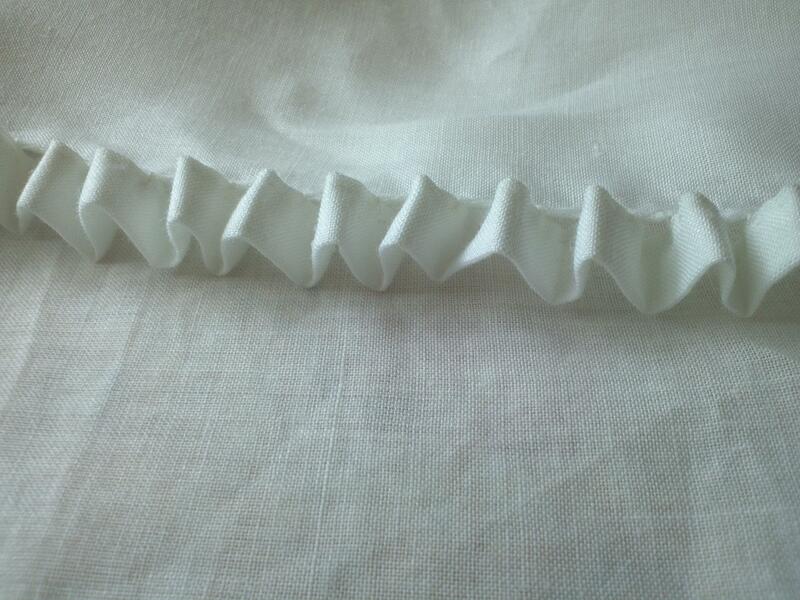 By stitching the veil tape to the veil at a 2:1 ratio, a nice ruffle is created. The veil strip is hand sewn with a running stitch. Temporary marks are placed on the veil tape and on the edge of the veil. Finally, the veil strip is sewn to the front edge of the veil with a whip stitch. I would line up the marked dots and anchor with two whip stitches. Then I would bend the veil tape the opposite direction and do the same thing at the next mark. After the veil strip is permanently attached, I simply sprayed some water on the edge of the veil and all of the blue marks just disappeared. A 2:1 ratio of veil tape to veil edge creates a lovely ruffle. The finished veil at a Yule Feast in An Tir. Twelfth Night is merely a month away for many of us, but this is still plenty of time to create a simple and stunning ruffled veil. Last spring, after the Kingdom of An Tir’s A&S championship, Queen Gwyneth Gower asked if I would be willing to make a frilled veil for her. I could not pass up the opportunity to veil a beautiful 14th century Queen who happened to also be a dear friend of mine. 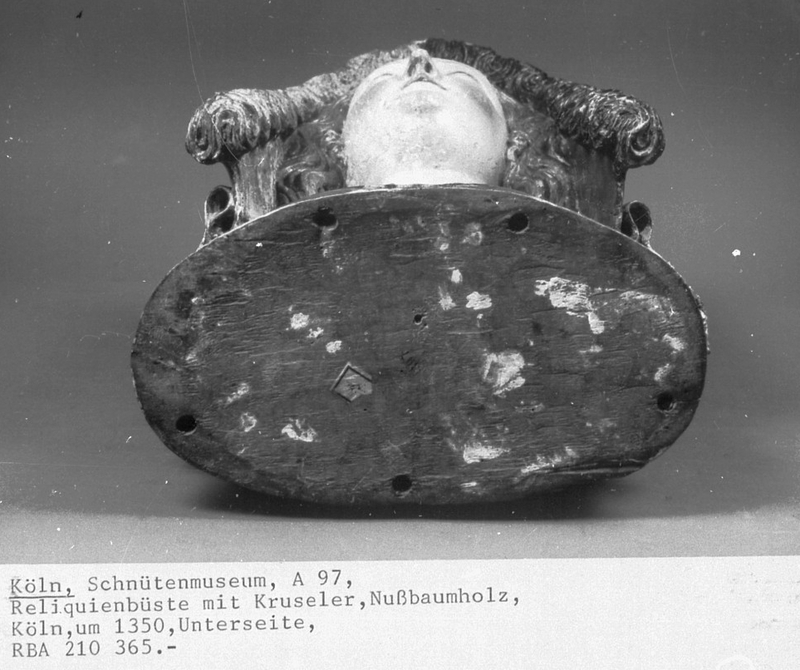 And so the search began…how to veil a Queen? After gathering several images of Royal ruffles, I began to consider the best style of frilled veil for Queen Gwyneth. I decided to create a long veil that could be folded on itself three times to match many of the brasses that appear to have three layers of ruffles. 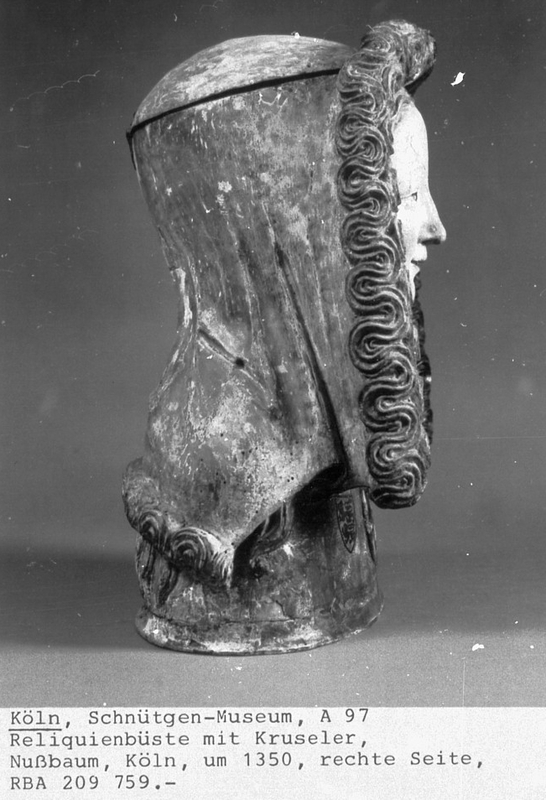 I consulted with Maitresse Elisabeth de Besancon, who had created a longer 15th century ruffled veil in this style. With much consideration, I set out to construct Queen Gwyneth’s veil at three times her shoulder to shoulder measurement with a front and back ruffle. This would be folded to create a layered ruffle look. After reading a report on a 14th Century Queen’s ruffled veil find in Prague that had included some embellishment, I made the decision to add a pearl embellisment to Queen Gwyneth’s veil. The outer edge of the large rectangle was hemmed on all sides. 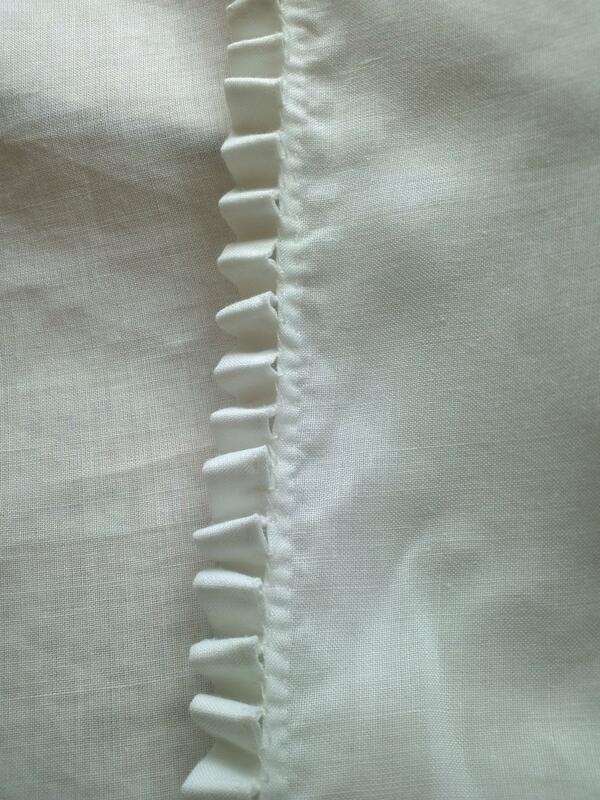 A long veil strip was hemmed for the ruffle. 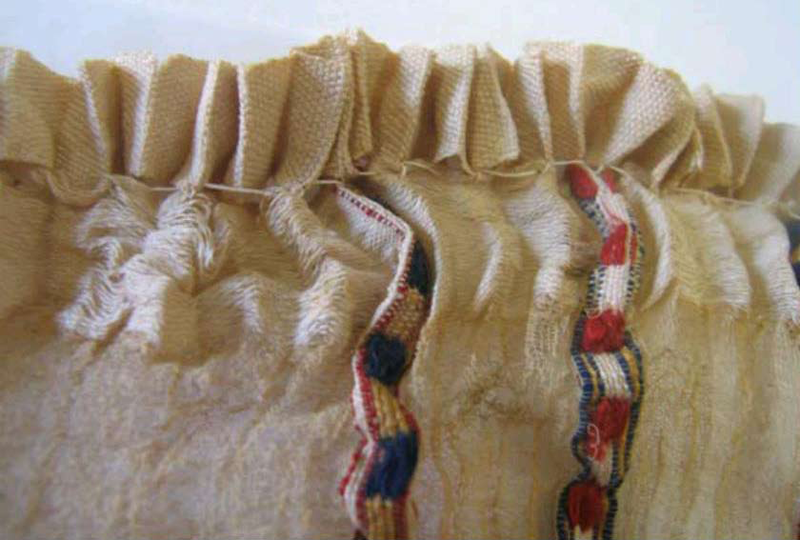 The edge strip is ruffled as it is sewn to the veil. 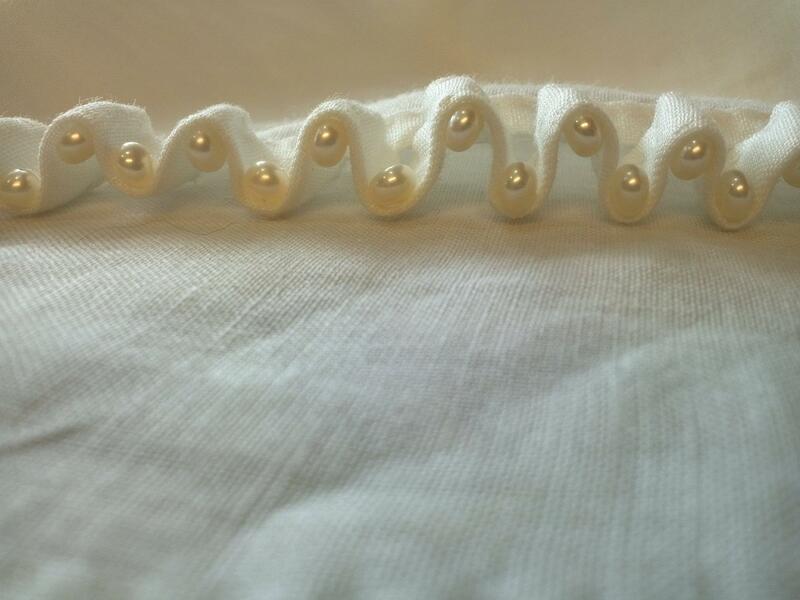 Pearls were added to the Queen’s veil. 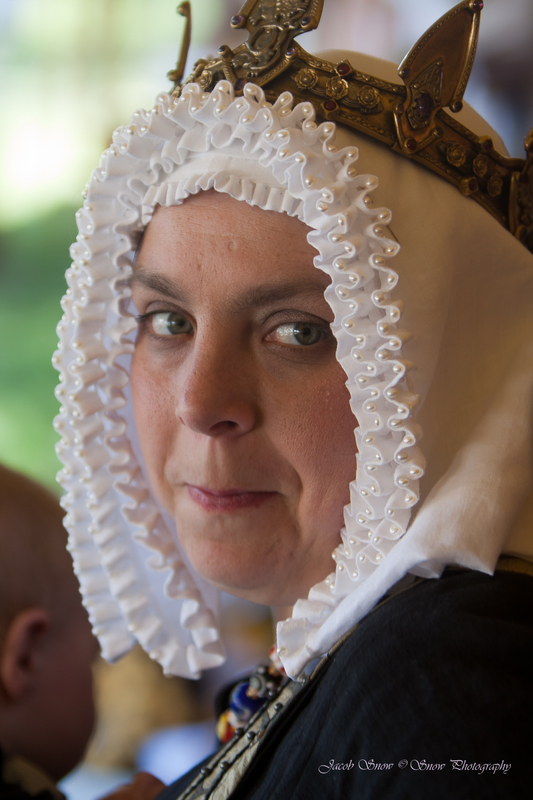 Queen Gwyneth wears the ruffled veil at July Coronation over a ruffled cap made by Maitresse Elisabeth de Besancon. When thinking about how to design this fretted veil, the thing I struggled with the most was always shape. How many layers were the frets actually attached to? Was it one long veil folded back and forth? If so, wouldn’t the frets collapse as they were bent around at the folds? 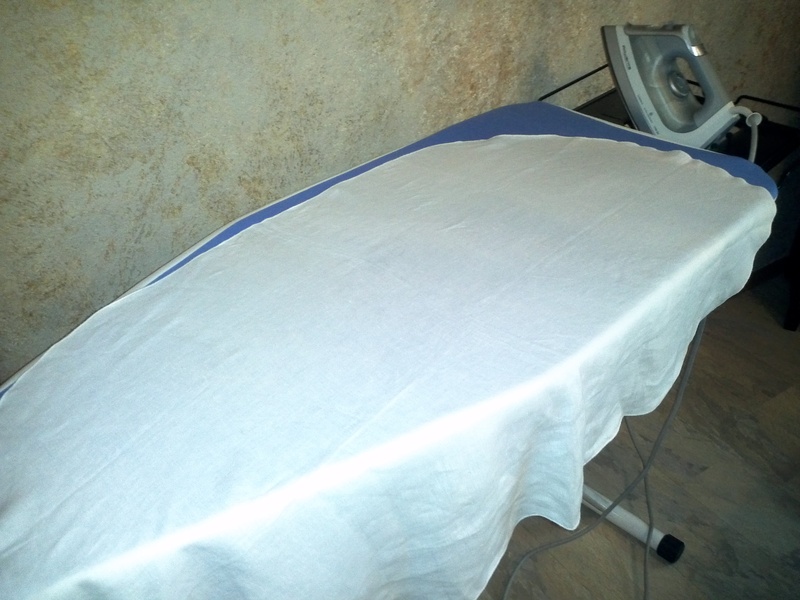 In the end, I designed one row of frets and folded the veil linen in half, with a center seam. It was the images below, which can be located at http://www.larsdatter.com/frilled-veils.htm, that gave me a better idea of how the sides of a frilled veil might hang and look.